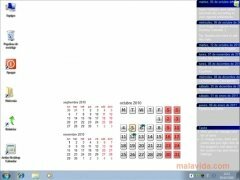 Active Desktop Calendar is a calendar that will always be visible on your desktop. If you need to have your notes, events and celebrations visible at all times, this software will come in very handy. 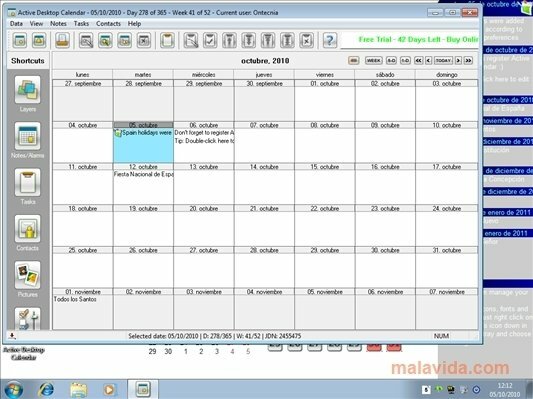 By installing Active Desktop Calendar you will obtain a calendar of the current month, as well as smaller images of the previous and following months, with marked dates and a brilliant sidebar with any notes you have made. Alarms, notes, celebrations, reminders and even the possibility to synchronize with Outlook or Google Calendar are some of the functions that are implemented in Active Desktop Calendar. It is all shown as a desktop "gadget", but behind it you will find a complete organization tool that can be launched by double clicking on its icon on the task bar. 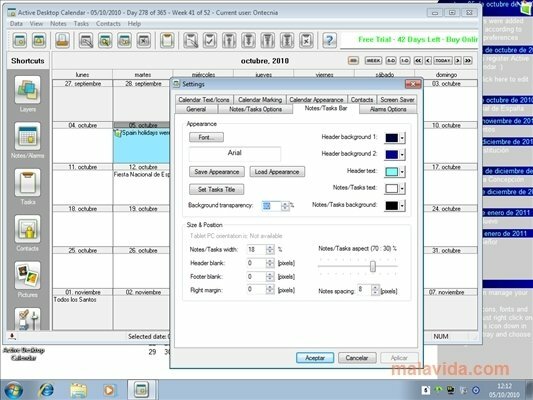 This software's design is very interesting because it allows you to change the background easily, and will always be clearly visible. Furthermore, it doesn't bother other applications because it's always in the background, sitting on top of the wallpaper. 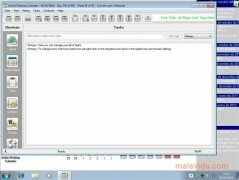 Download Active Desktop Calendar for free, an application that will help you organize yourself and remember any tasks you have pending.